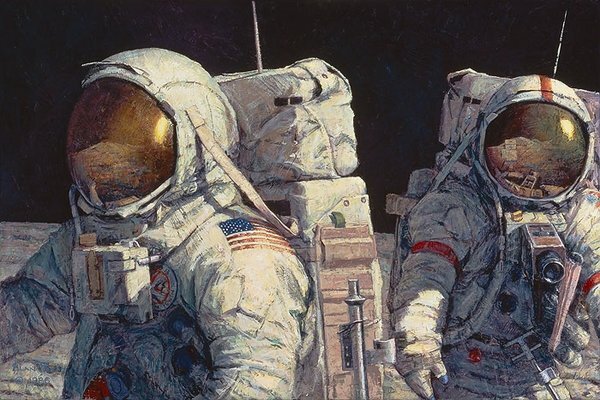 Image Size: 30"w x 20"h.
Jim Irwin leads Dave Scott as they move about their work on the Moon. Dave observed: “As we advance, we are surrounded by stillness. No wind blows, no sound echoes. Only shadows move. I hear the reassuring purr of the miniaturized machines that supply vital oxygen and shield me from the blistering 250-degree-Fahrenheit surface heat of the lunar morning.” The spacesuit appears bizarre and unworldly, but it contains a life-sustaining environment. Explorers throughout history have probably looked strange and unreal to the natives of the new lands they visited. But we were different. There were no natives and enclosed in our spacesuits we looked like creatures from other planets to our friends and family.